Take a nostalgic journey through the kitschy world of this '80s sitcom. 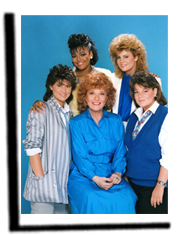 This 1979-1988 hit sitcom followed the lives of four young girls who attended a eastcoast private boarding school under the guidance of mentor Mrs. Garrett. The series had evolved during it's long tenure as the four main actresses grew up on screen and became became successful young college and career women. The Facts of Life and has been entrenched and firmly placed as one of the most influential television programs among teens that aired in the 1980's. After having a successful run of sketches on The Carol Burnett Show, NBC picked up the new series called Mama's Family in 1983. After a short two year run and cancellation, the show moved into syndication on CBS and ran for an additional four seasons and ended in 1990. 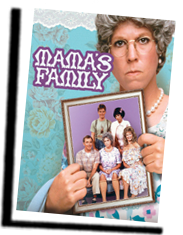 The show centered on sharp-tongued Mama, her dysfunctional family and annoying neighbor Iola. 13 years later, after the show ended in 1988, ABC reunites the cast for a 2 hour movie which aired for the ABC Network on November 18th, 2001. Mrs. Garrett returns from Africa, Blair suspects an affair from her husband, Dorothy would love to be in the theater, and Natalie is torn between two loves. 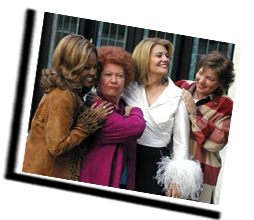 The Facts of Life Reunion Movie starred Charlotte Rae, Lisa Whelchel, Kim Fields and Mindy Cohn. Please check the right table to change your setting for optimal viewing of our website. To view the page exacly as intended please download two FREE fonts in one zip file; News Gothic MT and News Gothic Italic section. These fonts will allow you to view our site as intended. To install please copy and paste the fonts to your Windows/system/fonts folder on your hard-drive. By doing this they will install automatically and you may also use them in your word processor.